Into the Light: Alfred Stevens, more than just a pretty face? Alfred Stevens (1823–1906), Mary Magdalene (portrait of Sarah Bernhardt) (1887), oil on canvas, 111.8 x 77.3 cm, Museum voor Schone Kunsten Gent, Gent, Belgium. Wikimedia Commons. 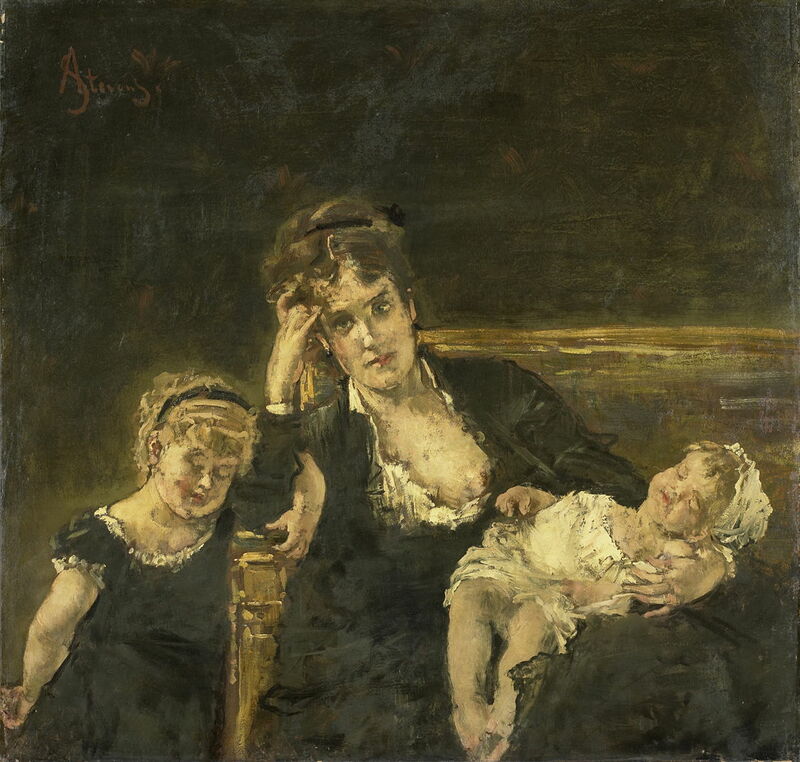 Hugely successful in his day, Alfred Stevens (1823–1906) is another nineteenth century painter who has quickly been forgotten. In his case, his commercial success was built largely on his lucrative business painting fashionable women in fashionable clothes. This was by no means unique: John Singer Sargent did very nicely from similar trade. But does Stevens, like Sargent, have anything more ‘serious’ to offer? Stevens, despite his English-sounding name, was Belgian, and born in Brussels to a family of painters. He studied first at the Académie Royale des Beaux-Arts in Brussels, before moving to Paris in 1843. He then studied at the École des Beaux-Arts in Paris, whose director at the time was Ingres, although it is unlikely that he was ever a direct student of Ingres himself. His earliest paintings show mastery of a conventional naturalistic and realist style in depicting genre scenes. His Salon career got off to a good start, with three of his paintings being shown in the Brussels Salon of 1851, and a third-class medal in the Paris Salon of 1853. Alfred Stevens (1823–1906), What They Call Vagrancy (the Vincennes Hunters) (1854), oil on canvas, dimensions and location not known. By Sailko, via Wikimedia Commons. 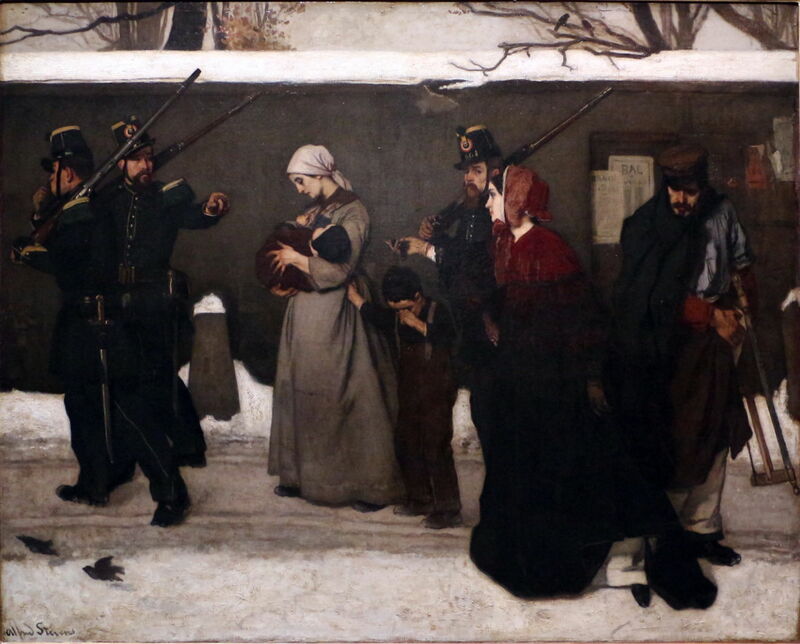 His campaigning painting What They Call Vagrancy (the Vincennes Hunters) (1854) so moved Emperor Napoleon III that he is reported to have ordered his soldiers to stop picking the poor up from the streets – the act which Stevens shows here. 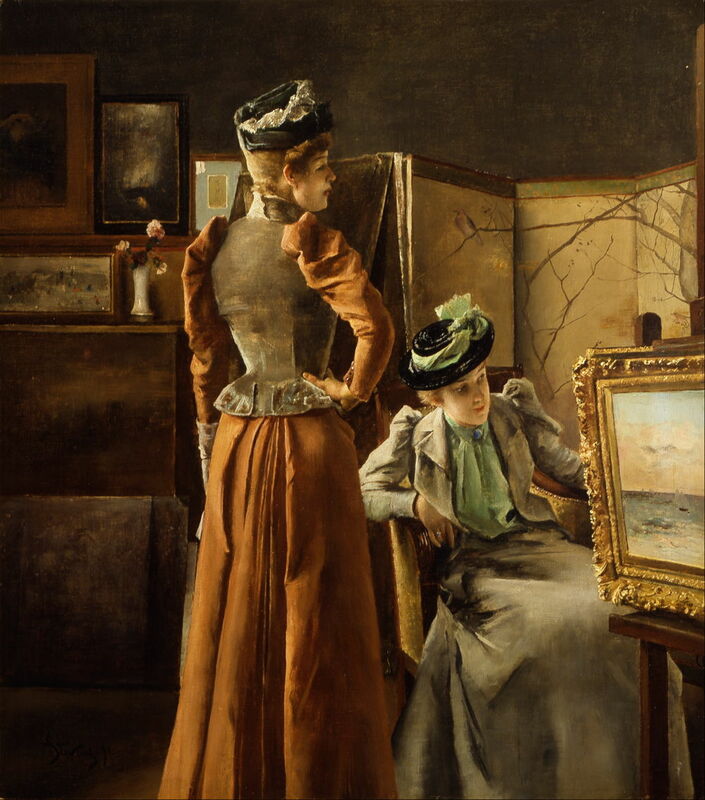 Alfred Stevens (1823–1906), The Painter and His Model (1855), oil on canvas, 92.4 x 77.3 cm, Walters Art Museum, Baltimore, MD. Wikimedia Commons. 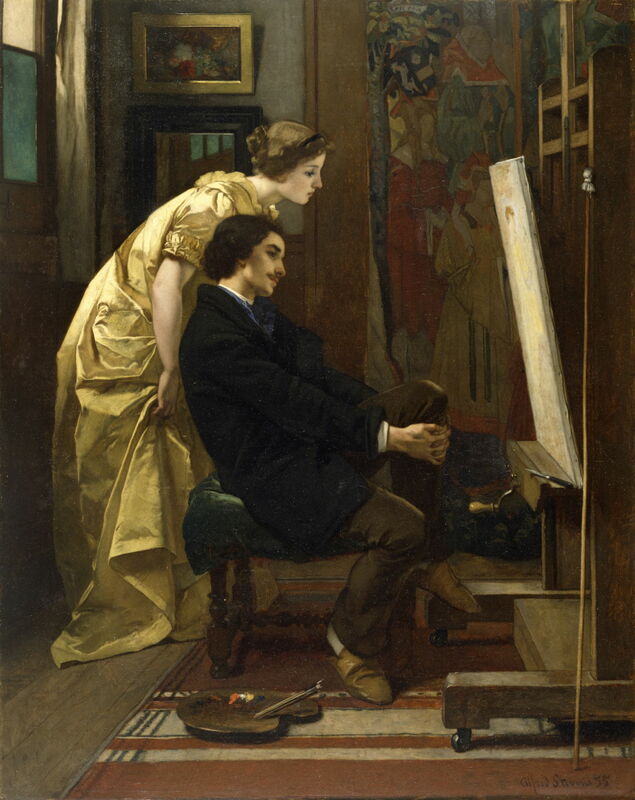 The Painter and His Model (1855) shows one of Stevens’ young and fashionable models leaning over his shoulder, as he works on her portrait. In 1858, Stevens married, with Eugène Delacroix acting as one of the witnesses. Alfred Stevens (1823–1906), Will you go out with me, Fido? (1859), oil on canvas, 77.5 × 64 cm, Philadelphia Museum of Art, Philadelphia, PA. Wikimedia Commons. Will You Go Out With Me, Fido? (1859) is an example of the steady change in Stevens’ style and subjects. With his eye for pretty young women clad in the latest fashions, seen in fashionable interiors, the triviality of the pictorial content seemed not to matter. As he entered the 1860s, Stevens started to enjoy great success, and was in constant demand as a portrait painter. He was good friends with Manet, Degas, Berthe Morisot, Whistler, and others, and met with the early Impressionists at the Café Guerbois in Paris. He was invariably the talk of the Salon each year, receiving first-class medals and being elevated to high rank in the Legion of Honour. 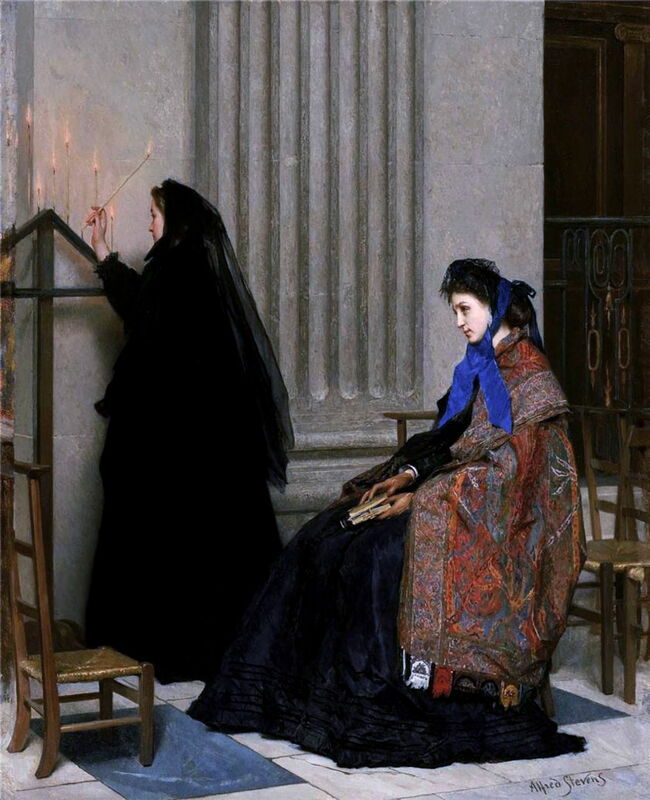 Alfred Stevens (1823–1906), In Memoriam (c 1861), further details not known. Wikimedia Commons. Looking beyond those profitable portraits, there is still evidence that Stevens was interested in, and painting, the more meaningful. His In Memoriam (c 1861) shows the all-too-common consequences of early death on wife and family. 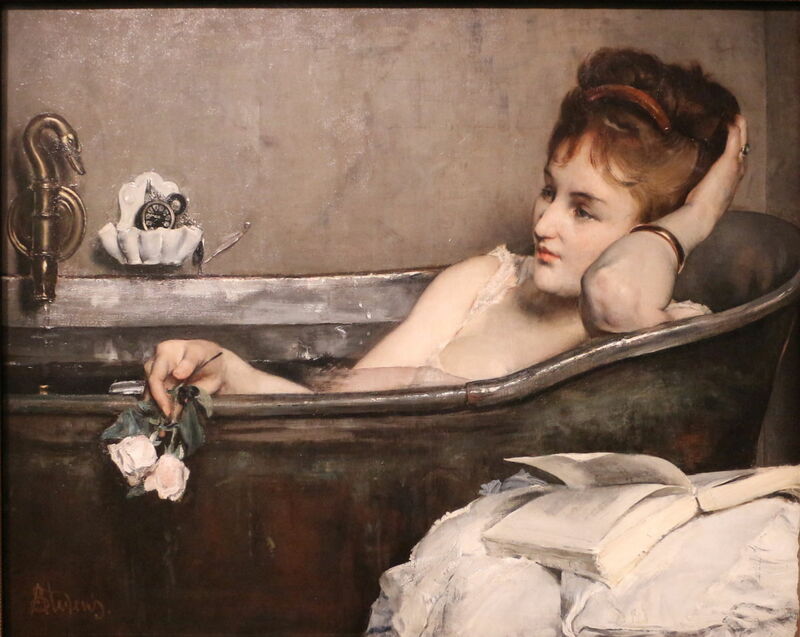 Alfred Stevens (1823–1906), The Bath (1867), oil on canvas, dimensions not known, Musée d’Orsay, Paris. By Sailko, via Wikimedia Commons. Some of those paintings which at first looked like mere frippery have greater depth. The Bath (1867) begs bigger questions. Why is this woman still wearing her underclothing? Is her book a popular novel, or something with more gravitas? Why is she clutching a couple of rose flowers in her hand? Stevens’ brushstrokes are also becoming more broken, and less meticulous when away from flesh. Alfred Stevens (1823–1906), The Psyché (My Studio) (c 1871), oil on panel, 73.7 x 59.1 cm, Princeton University Art Museum, Princeton, NJ. Wikimedia Commons. Stevens was an early enthusiast for the Japonism(e) which swept Paris, and the Impressionists in particular. Insights into his life such as his The Psyché (My Studio) (c 1871) repay closer reading. 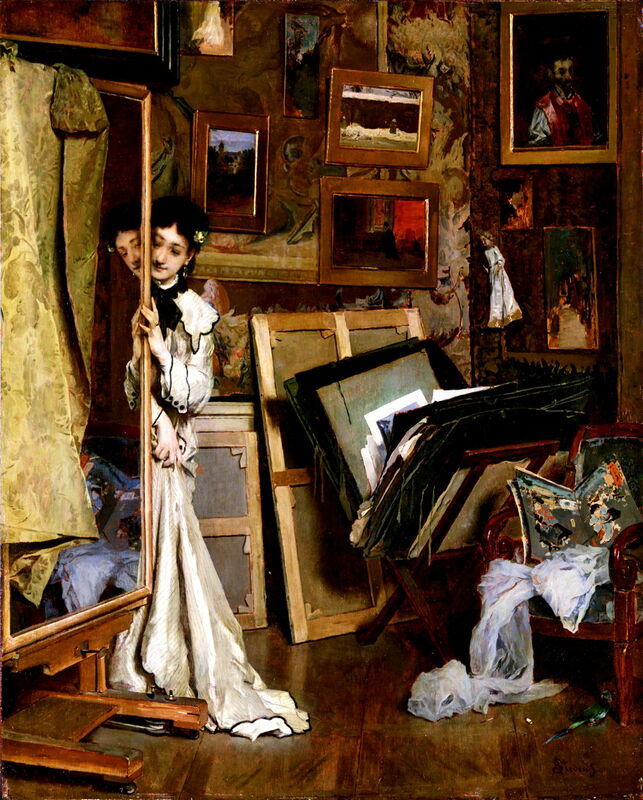 The French word psyché refers to the full-length mirror seen in this apparently informal view of Stevens’ studio, the name deriving from the legend of Cupid and Psyche. For this painting, Stevens doesn’t actually use a proper psyché, but has mounted a large mirror on his easel, perhaps to suggest that art is a reflection of life. A Japanese silk garment is draped over the mirror to limit its view to the model, breaking up her form in an unnatural way. At the lower right, the artist indicates his presence with a cigarette, and there is a small parrot who might imitate his speech. The studio is littered with Japanese prints and the artist’s canvases, and one painting on the wall is a study for his early What They Call Vagrancy, which lacks most of the figures. This looks like an essay on reality and its imitation, perhaps. 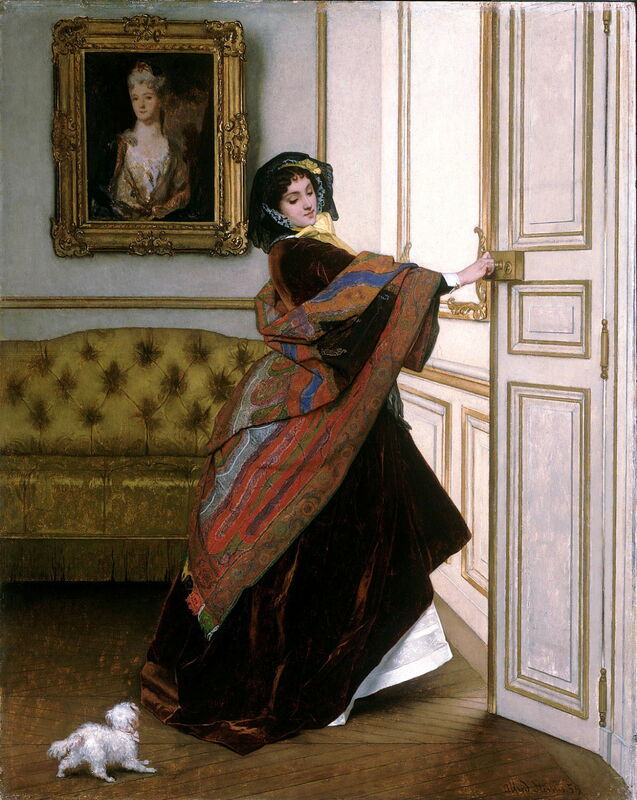 Alfred Stevens (1823–1906), The Japanese Parisian (1872), oil on canvas, 105 × 150 cm, Musée d’art moderne et d’art contemporain, Liège. Wikimedia Commons. Even his more conventional studio portraits are less than straightforward. 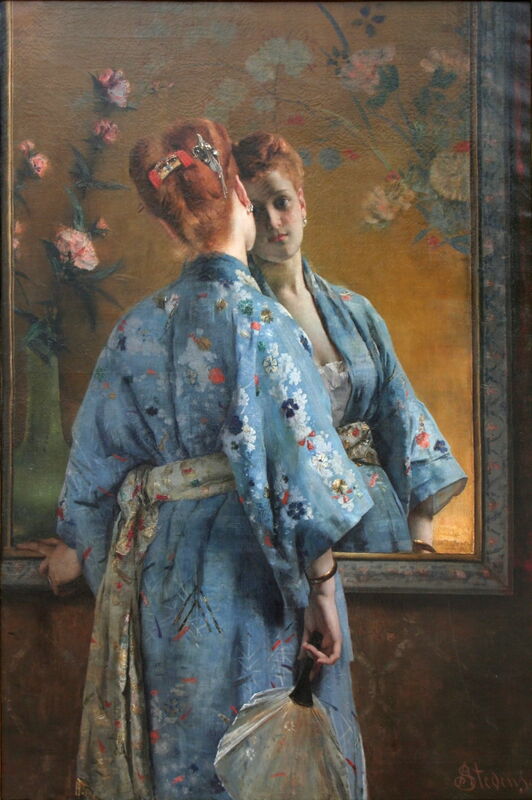 In his The Japanese Parisian (1872), a woman dressed in fashionable Japonisery, and holding a fan behind her back, is reflected in a large mirror. But around her in that mirror it looks to be a painting, not a reflection. In 1880, Stevens started to holiday by the sea for health reasons, and entered into a three year contract with dealer Georges Petit, a scoop for the latter. He then painted many more landscapes – almost all of which are now in private ownership and inaccessible. Alfred Stevens (1823–1906), Little Girl with Ducks (1881), oil on canvas, 101 x 74 cm, Private collection. Wikimedia Commons. 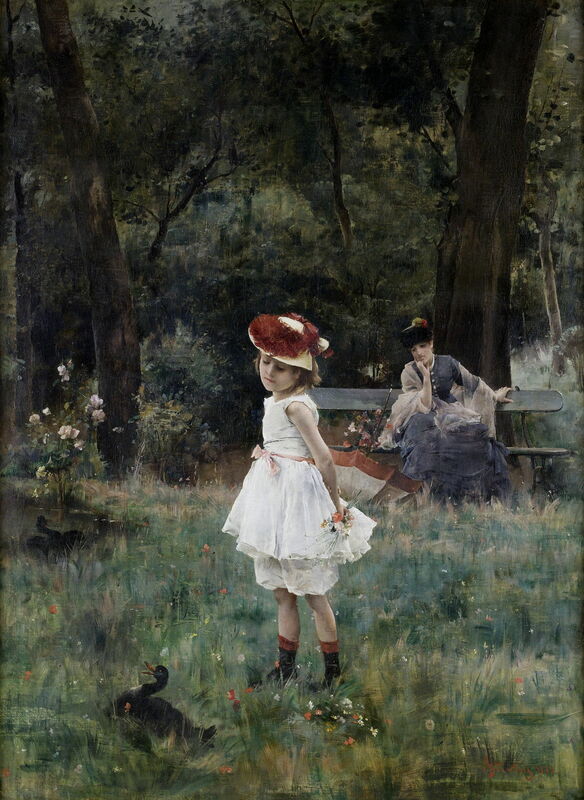 Little Girl with Ducks (1881) is a delightful portrait of this girl and her mother (or governess, perhaps), but most of the canvas has become softly Impressionist, with flowers popping out of very gestural grass. 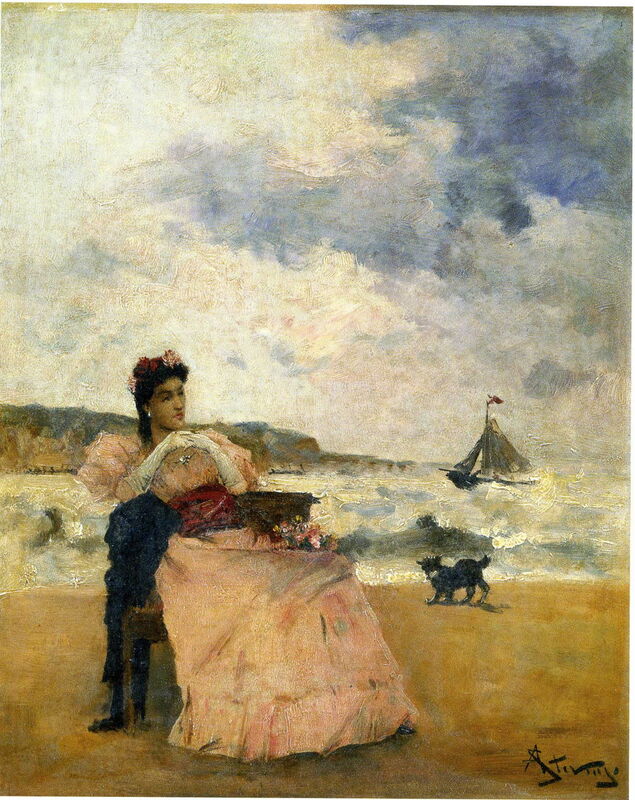 Alfred Stevens (1823–1906), Woman on the Beach (date not known), oil on panel, 40 x 29 cm, Private collection. Wikimedia Commons. Although most are undated, I think that he painted many small panels during his months by the sea. Most, like his Woman on the Beach, are unashamedly Impressionist. 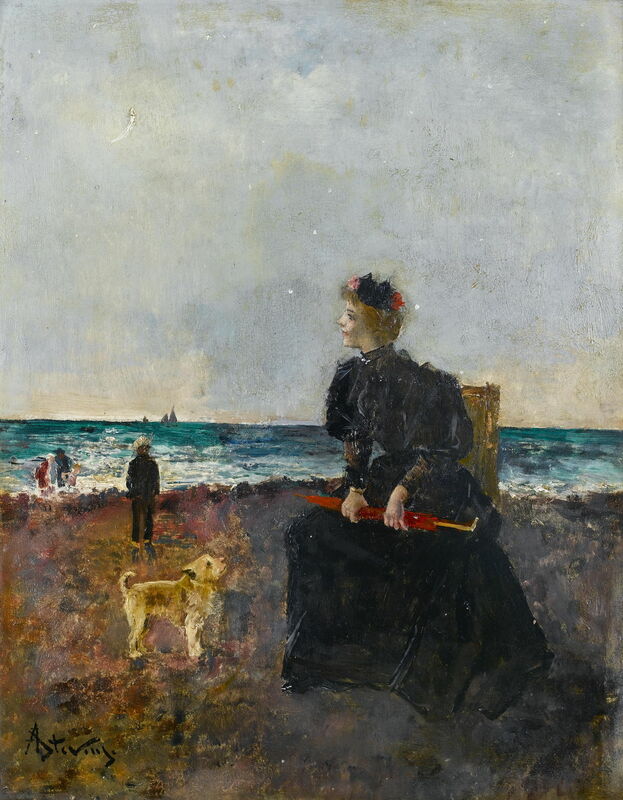 Alfred Stevens (1823–1906), Woman Sat on the Beach (date not known), oil on panel, 40 x 32.5 cm, Private collection. Wikimedia Commons. Alfred Stevens (1823–1906), Young Italian Girl (date not known), oil on panel, 46.5 x 37.5 cm, Private collection. Wikimedia Commons. Alfred Stevens (1823–1906), The Widow (date not known), oil on canvas, 80 × 82 cm, Rijksmuseum, Amsterdam. Wikimedia Commons. Some, like The Widow, return to his earlier social themes too. Stevens took on private students, including the international superstar Sarah Bernhardt, who was an accomplished painter and sculptor. Another famous student was the American Impressionist William Merritt Chase. 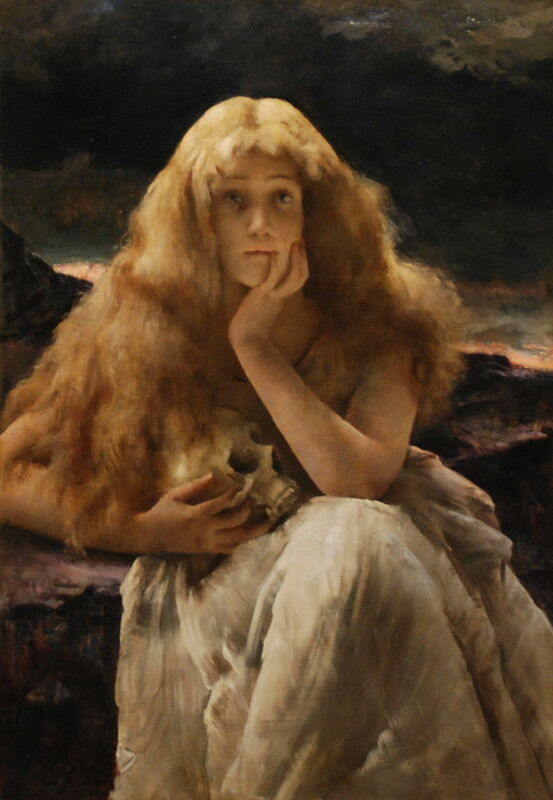 He first painted Sarah Bernhardt in the year that they met, 1887, in a dramatic role as Mary Magdalene. Commissioned by dealer Georges Petit, its provocative and sensual depiction shocked the public, who were more comfortable with traditional versions showing Mary as a remorseful penitent. Alfred Stevens (1823–1906), In the Studio (1888), oil on canvas, dimensions not known, The Metropolitan Museum of Art, New York, NY. Wikimedia Commons. 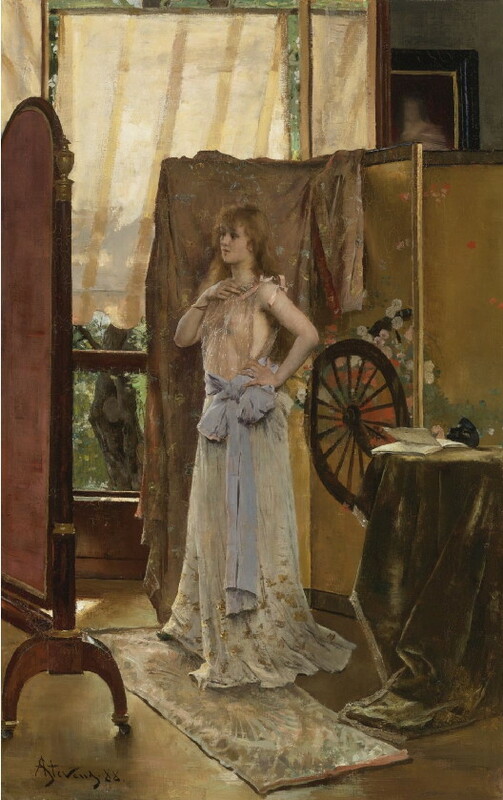 He also turned to more reflexive views of his models and studio again, such as In the Studio (1888), which reveals a young and very pretty student at work on the canvas. Alfred Stevens (1823–1906), Study of the Role (1888), oil on canvas, 94 × 59 cm, Private collection. Wikimedia Commons. 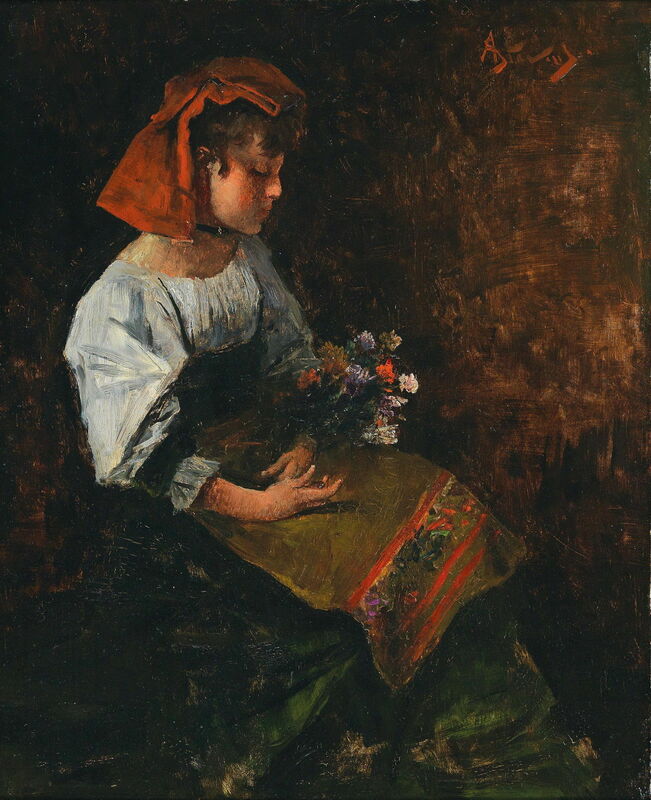 His Study of the Role (1888) shows a young actress preparing for her stage role, dressing the part, and stood in front of another psyché (a real one, this time). The theme recurs: it’s all about appearances, about assuming the role, and playing the part convincingly. 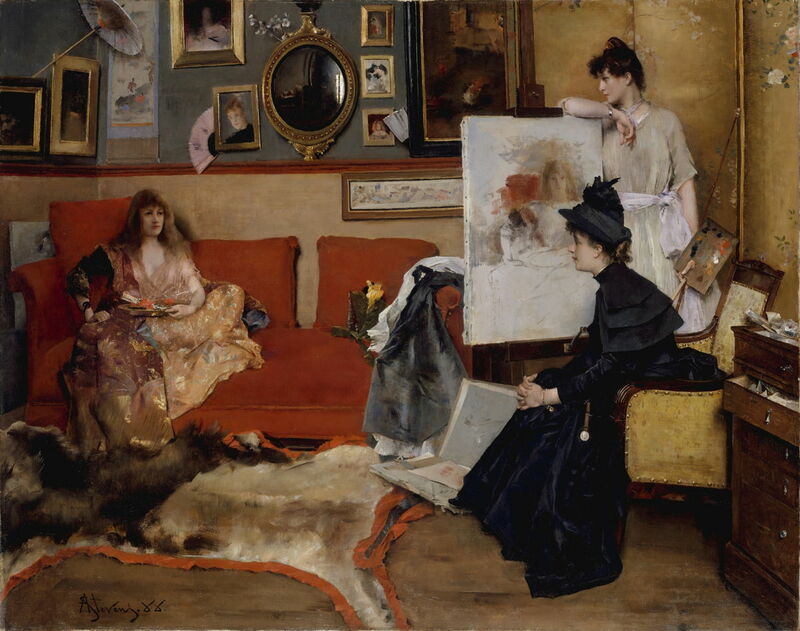 Alfred Stevens (1823–1906), Visit to the Studio (1891), oil on canvas, dimensions not known, Indianapolis Museum of Art, Indianapolis, IN. Wikimedia Commons. Carefully showing off his models’ enviable figures, and the changing fashions, his Visit to the Studio (1891) is more about viewers and the gaze. In 1900, he was the first living artist to be honoured with a retrospective exhibition at the École des Beaux-Arts in Paris. Alfred Stevens (1823–1906), The Myopic Woman (1903), oil on canvas, 41 x 33 cm, location not known. Wikimedia Commons. 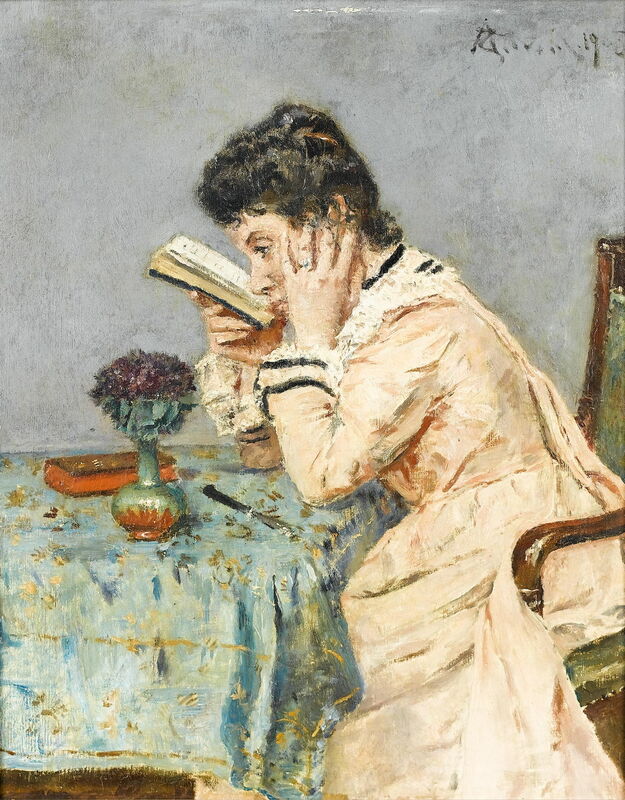 Towards the end of his life, he painted more quick oil sketches, such as The Myopic Woman (1903), holding her book pressed almost to her cheek in order to read it. The great difficulty with trying to get to grips with Stevens’ work is how little of it can now be seen. It is a bit like navigating your way through Sargent’s studio portraits alone. Hopefully these paintings have shown that there was a lot more to Stevens than fashionable women in fashionable clothes. Posted in General, Painting and tagged Impressionism, japonisme, painting, Sargent, Stevens. Bookmark the permalink.